Knee ligaments play an important role in the stability of the knee. Knee is a diarthrodial joint. It is a superficial joint and large weight-bearing joint. Because of this, it is exposed to multiple forces throughout the day. Inherently knee joint is not very stable, owing to its constituent articular surface which allows for rotation as well as translation during flexion-extension movements. The knee is stabilized by many ligaments and other soft tissue structures. This ligament prevents the anterior translation of the tibia on the femur. It is an intracapsular ligament but extrasynovial. It originates from the medial aspect of the lateral condyle. Its posterolateral bundle originates posterior and distal to anteromedial bundle on the femur. Anteromedial bundle fibers are parallel in extension and are tightened both in flexion and extension. Fibers are externally rotated in flexion. Posterolateral bundle prevents internal tibial rotation with knee near extension. These fibers are tight in extension, loose in flexion. Anterior cruciate ligament inserts anteriorly through a broad and irregular insertion between the intercondylar eminences of the tibia. 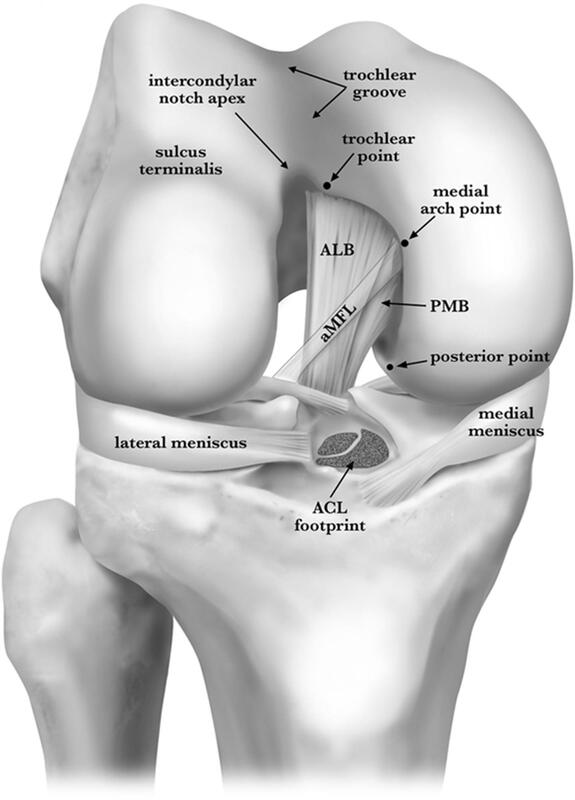 ACL contains significant innervation by posterior articular branches of the tibial nerve. It has mechanoreceptors (Ruffini, Pacini, Golgi tendon organs, free-nerve endings) for proprioception and modulation of quadriceps function. Posterior cruciate ligament prevents posterior translation of the tibia on to the femur [compare with ACL], especially at 90 degrees of flexion. It also resists varus displacement at 0 degrees of flexion. Posterior cruciate ligament or PCL and posterolateral corner or PLC [see below] work together to resist posterior translation and posterolateral rotatory instability. Like anterior cruciate ligament, it is extrasynovial but intracapsular. It originates from medial femoral condyle and inserts on tibial sulcus. It also has got two bundles – anterolateral and posteromedial. The anterolateral bundle is shorter, thicker and stronger. It is tense in flexion. It represents about 65% of the substance of the PCL. 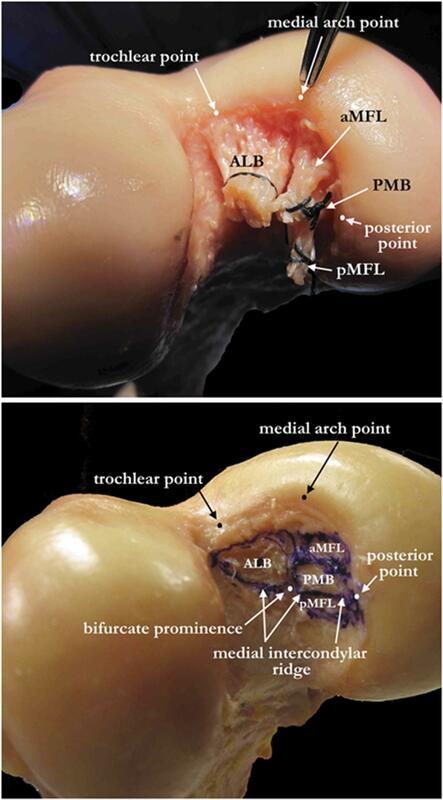 PCL originates from the anterolateral aspect of medial femoral condyle in the area of the intercondylar notch. The origin is quite anterior than that of ACL. Medial intercondylar ridge marks the proximal border of femoral insertion medial whereas bifurcate ridge separates the anteromedial bundle from a posteromedial bundle. Tibial attachment is not intraarticular, but over the back of tibial plateau, approximately 1 cm distal to the joint line. Main source of blood supply of PCL is middle geniculate artery. Native strength is 2500 N.
It is also called fibular collateral ligament. It resists varus angulation and displacement and works together with MCL to restraint to axial rotation. It originates on lateral femoral condyle, posterior and superior to popliteus insertion, runs superficial to popliteus and gets inserted on the fibula, anterior to the popliteofibular ligament. [Capsule’s most distal extent is just posterior to the fibula]. It is a cord-like structure which is tight in extension and lax in flexion. The strength is about 750 N.
It is the term for structures which work synergistically with the posterior cruciate ligament to control external rotation and posterior translation. Arcuate & fabellofibular ligaments extend from the apex of fibular styloid process & ascends vertically to lateral head of gastrocnemius, where they merge with the posterior termination of the oblique popliteal ligament. Both may always be not present. Medial collateral ligament is on the medial aspect of the knee and resists valgus angulation. It works with anterior cruciate ligament to restraint to axial rotation. It extends from medial femoral condyle to tibia extending down several centimeters. It has two components – superficial and deep. Superficial part is also called tibial collateral ligament and deep part is also called medial capsular ligament. Superficial part lies just deep to gracilis and semitendinosus and anatomically forms the second or middle layer of the medial soft tissue complex of the knee. Superficial part takes origin from medial femoral epicondyle and inserts into periosteum of the proximal tibia, deep to pes anserinus. At 25° of flexion, MCL provides 78% of the support to valgus stress whereas, at 5° of flexion, it contributes 57%. Superficial part can be divided into anterior & posterior portions. Anterior fibers of the superficial portion of ligament appear to tighten in knee flexion of 70 to 105 deg. Posterior fibers form the posterior oblique ligament. 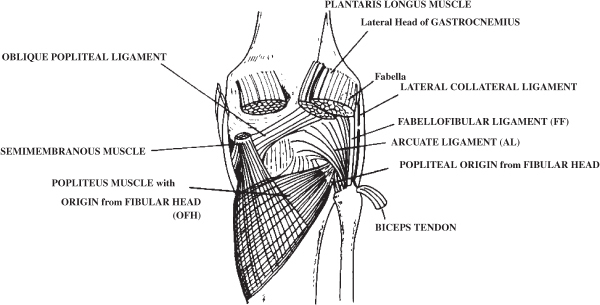 Also called medial capsular ligament, it is separated from the superficial portion by a bursa. It gives an attachment to the medial meniscus [coronary ligament]. Deep part is divided into meniscofemoral and meniscotibial parts and called as meniscofemoral and meniscotibial ligaments. 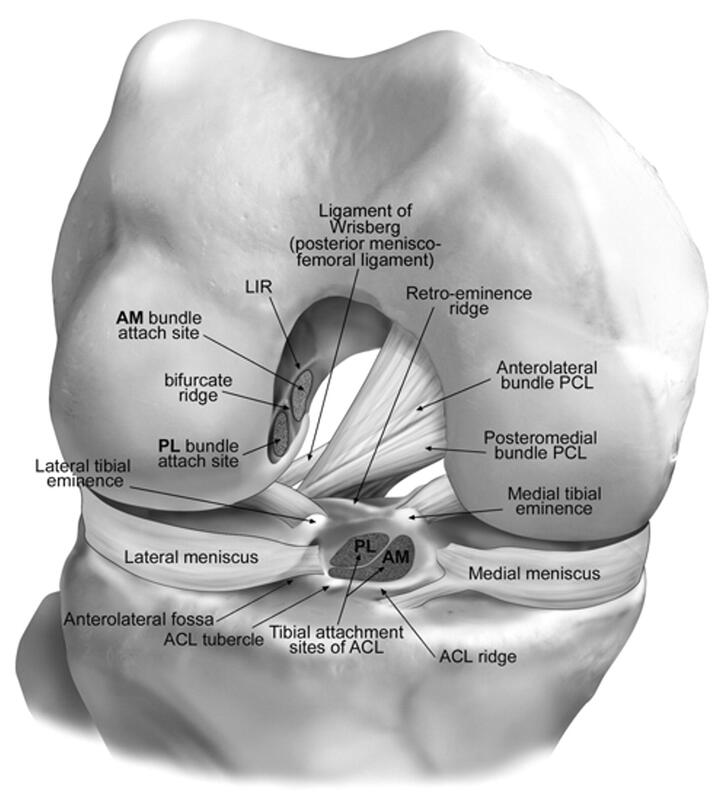 Posterior fibers of the deep MCL blend with posteromedial capsule and posterior oblique ligament. It firmly attached to the meniscus but does not provide significant resistance to valgus force but together with posteromedial capsule act as secondary restraints to valgus stress at full knee extension. The ligament is attached to medial femoral condyle, distal to adductor tubercle and proximal to medial collateral attachment. It inserts as a fan-like structure inserting at the junction between proximal-middle thirds of the superomedial border of the patella. It lies in layer 3 of lateral soft tissues, with the lateral collateral ligament. It provides rotational stability. It is about 59 mm long and width varies from 7 -11 mm at different points. Segond’s fracture is avulsion fracture of lateral tibial condyle associated with is avulsion fracture of ALL rupture.